Blue-White Colored Bulb Cover For T3-1/4 Bulbs - Blue-White translucent precision molded bulb cover for T3-1/4 Bulbs. Each Cover measures 0.51" (13mm) Maximum Overall Length, 0.415" (10.5mm) Maximum Outer Diameter. 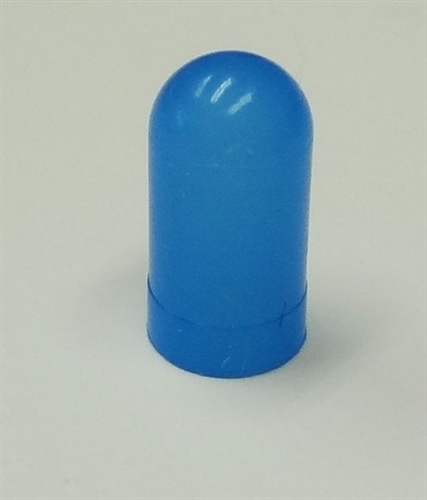 These pliable slip-fit colored filter caps are an economical way to enhance your lighting application. Colored bulb covers are precision molded, reusable, interchangeable and durable. These Colored Bulb Covers are resistant to various ambient conditions such as Ozone, sunlight and many chemicals. Colored Bulb Covers are impervious to color shift and are temperature stable from -50 degrees Celsius (-50 Fahrenheit) to 180 degrees Celsius (356 Fahrenheit).